When I was very young, a teen, I began my career with the Long Beach Public Library. The staff was really a close knit bunch, from Administration to Pages. Everyone interacted and everyone cared about the library and each other. It was a wonderful time. We had a decent amount of staff, who all felt valued. Communication was good. The library thrived because staff were happy and took pride in their jobs, therefore patrons were happy. I hear it was even better before I got there. When I started with LBPL, co-workers had a bowling league, and there were many parties on and off site. Morale was high. Greg, Jill & Pat Reynolds, with Louise Mazerov in front. 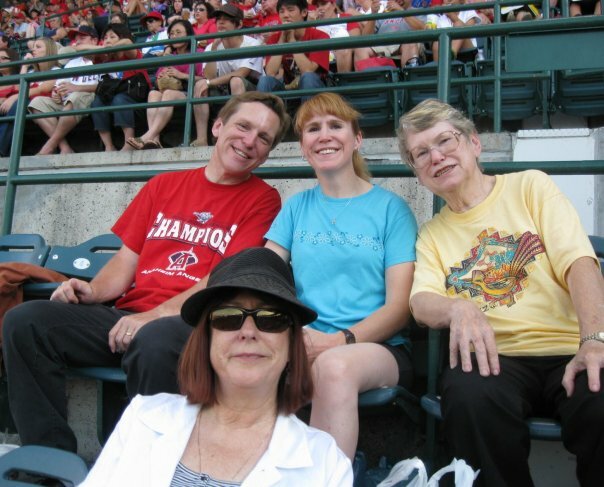 I attended my first professional baseball game and first hockey game with Library staff; anyone who wanted to attend, did. These sports events were usually organized by the witty Pat Reynolds. (Staff was all so friendly, that years later, Pat’s son, Greg, became my husband and then he went on to become a librarian at Los Angeles Public Library.) We had huge groups go to Dodgers games, smaller groups go to the L.A. Kings games. Staff went to Angels games later on, too. There were numerous Library dinners. I had my first Thai food (thanks to Madeline Pratt) and first Indian food (thanks to Stace Aspey and Rick Zaun). I quickly became very involved in planning events, like Summer Picnics. The staff had off-site Summer Picnics every year. By the time I came onto the scene, our choices were El Dorado Park or the Rancho Los Cerritos. Everyone turned out from the Main Library and from branch libraries to attend these lively gatherings. My little story revolves around the preparation for one of these Summer picnics. A library staff picnic at the Rancho. At this time, although the Library’s security officers were employed by the Police Department, they were dedicated Library staff. When I started, we had three security officers on staff at the Main Library, but during this story, we were down to two officers. Our beloved Charlie Scott was the officer in charge, and it was he who recently had to tell me the name of the security officer involved in my story. Preparing for the Summer Picnic was a big job. 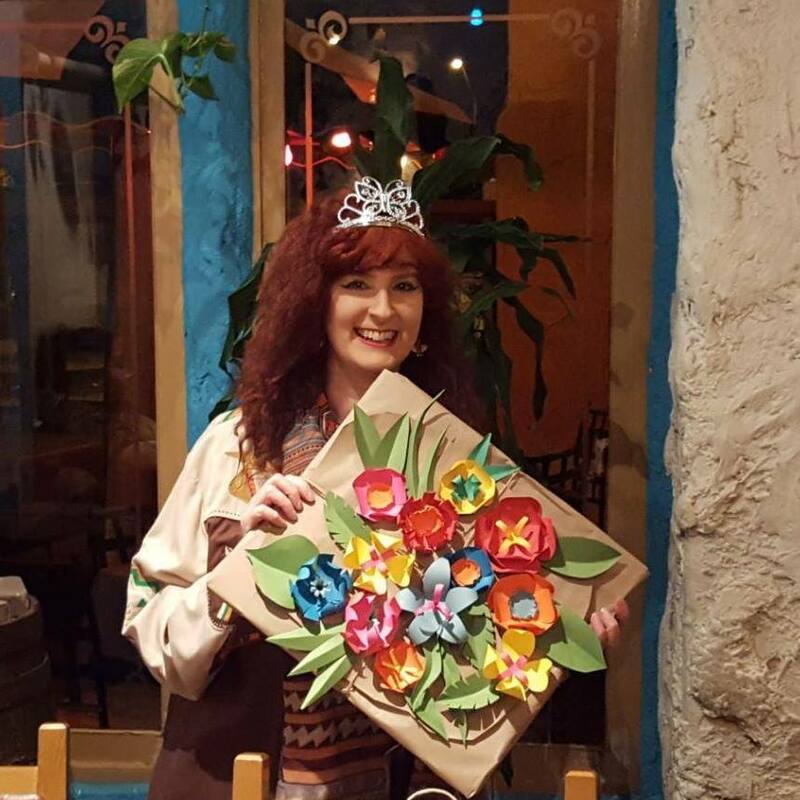 You wanted everyone to have a fabulous time. 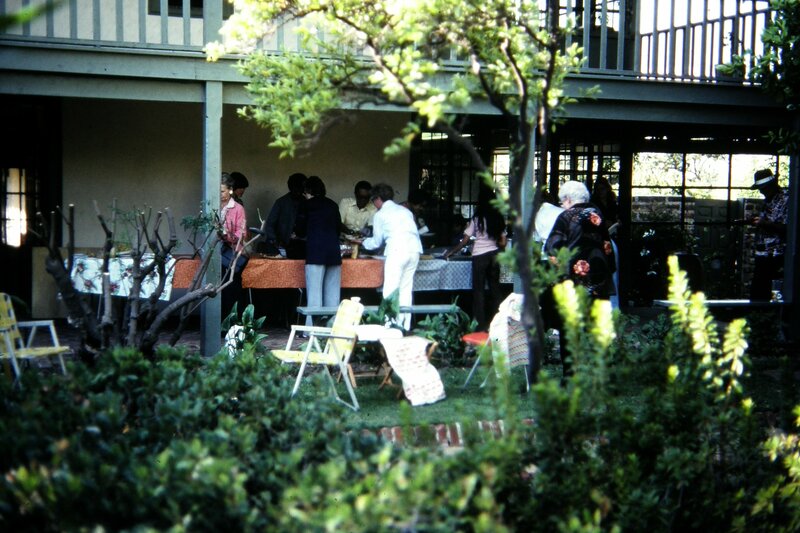 This particular year, the picnic was going to be at the Rancho Los Cerritos, after work on a Saturday. Every year there were games, and lots and lots of food,. This year, I was also going to include a pinata and water balloons. I knew filling up water balloons would be time consuming, so it needed to be done ahead of time. I planned to fill the balloons up in the kitchen at the Main Library, then put them in big bucket-like containers, and take the balloons to the picnic, already filled up. I began the long, long process of filling up a ton of small balloons. The buckets were very heavy. One of the security officers, an older gentleman named George Peterson, volunteered to lug these impossibly heavy containers out to my old grey Toyota Corolla hatchback while I filled up the balloons. Although I didn’t know him well, I was very grateful for this offer since I was running low on time, and, I hadn’t realized how difficult it would be to get these containers from the lower level kitchen, up to the lobby, across the City Hall Plaza to the Civic Center Parking structure, where we had to park on the weekends. Officer Peterson was an incredible help. He dragged all those balloons out to my car. As the Library was closing I headed out to my car happy and relieved to have at least part of my responsibilities taken care of. Officer Peterson returned my car keys and I began walking to my car thinking of everything else I had to do.. I arrived at my car. There were no water balloons. I mean, NONE. Not one of the many, many giant containers overflowing with water balloons was to be found. I looked all over. I couldn’t believe my eyes. Who would take water balloons? HOW did they take them? They were so heavy. WHY would someone take them? I needed those balloons. What happened? Charlotte says her car looked like this one, but not so nice! Well, this is when panic, and a lot of nervous sweating, set in. We were hoping against hope that the owner of the other car had not yet left the premises. Thankfully, their car was still in the same place where Officer Peterson had found it. We had to get ALL THOSE BALLOONS out of the mystery person’s car,before they returned. I did not relish the idea of trying to explain to them what had happened. I was glad that Officer Peterson was wearing a uniform which clearly displayed that he worked for the Long Beach Police Department. I can’t imagine what a person might think otherwise. We lugged all those darn balloons out of the wrong car and got them into my car. It was quite a task. I drove the balloons out to the Rancho. I think only those people who arrived early even got to “use” the balloons, but they had great fun. I was so young, and unsettled by the “wrong car incident,” I didn’t share this story with many people. I was scared that the officer might get in trouble. In hindsight, it is quite amusing. I definitely laugh about it now. I still wonder what the owners of the other Toyota thought when they discovered water residue in their car. Seriously, what conclusion did they come to? What would you have thought? Ha!